Capturing of Screenshot of Web page is a one type of functionality which can be used for different purposed in our web application. 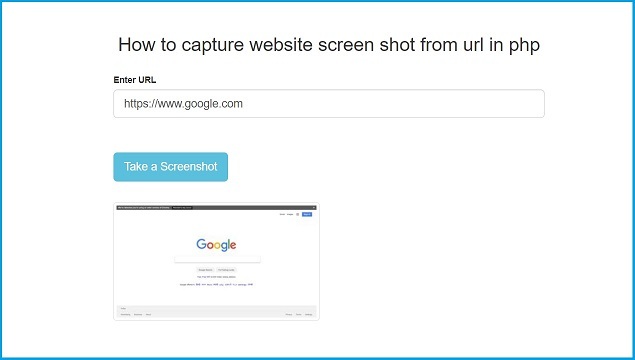 If you want to put this feature in your web application then there are number of third party APIs are available on the web for capture screenshot of the website from URL. But if you want to make your own script which can take a screenshot of website from URL, then you can get this feature by using PHP with Google PageSpeed Insights API. Mainly, This Google PageSpeed Insights API is used for calculate the speed of a web page, but we can also use this Google PageSpeed Insights API for capture a website screenshot from URL. In this post we will seen you how can we take a screen shot from URL of website by using Google PageSpeed Insights API with PHP script. To take screenshot of Web page, Google PageSpeed Insights API required to pass following parameters. url - In this parameters we have to pass URL of the website. screenshot - This parameters screenshot=true is used for fetch screenshot data. Below script you can see how to make a form for take website screenshot from URL which has be entered by use and after this it will load webpage screenshot on page.